Report on the 9th annual Pinot Days San Francisco Grand Festival Tasting, on Saturday June 30th, 2013, at Fort Mason in San Francisco. The event focuses on current releases of Pinot Noir from producers in California and around the world. Pinot Days includes a number of events leading up the Grand Festival Tasting. In the week before that Sunday, there were five focused tastings at a number of Bay Area wine shops and wine bars, and a winemaker dinner at One Market Restaurant in San Francisco (presented in conjunction with the American Institute of Wine and Food). 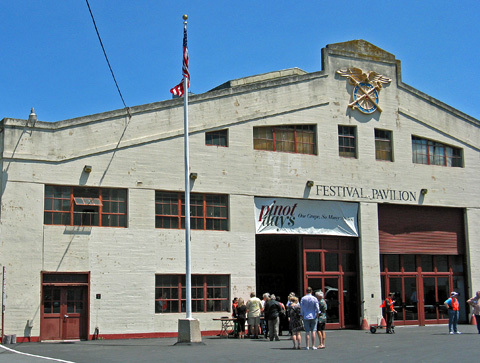 There were also four seminars presented at Fort Mason the day before and the day of the Grand Festival Tasting. Over 125 individual producers and trade groups from overseas were represented at this year’s Pinot Days event. Most wineries were from California – from nearly every Pinot region in the state – and there were also a few Oregon wineries and a small number from New Zealand. In addition to the wide variety of Pinot Noirs and some Pinot-based Rosés and sparklers, there were a few non-Pinot wines on hand, which actually proved a nice change of pace. As usual, Pinot Days was very well-organized, and everything ran smoothly at the Grand Festival Tasting. The number of wineries pouring at the event has declined somewhat in the past few years, but the benefit to tasters was more room to circulate among the tables. There was good signage at the winery tables, making it easy to find specific producers. Unlike the past few years, Oregon wineries were not grouped together, perhaps due to the smaller number of Oregon wineries pouring there. As mentioned above, the only non-US Pinots this year were those at the New Zealand Winegrowers’ table. The Pinot Days Grand Festival Tasting has always differentiated itself from most other large wine tasting events in its nearly-exclusive focus on the wine – there were few non-wine exhibitors there, and very few food purveyors, though El Porteno Empanadas has been a consistent presence at the event in recent years. Grape-Nutz colleague Al Osterheld joined me for awhile at the Grand Festival Tasting, but we spent much of the afternoon tasting separately. With a limited time to taste and lots of fine wines being poured, I passed on some good producers whose wines I’d tasted earlier this year – Balo, Handley, Loring, Pali, Waits-Mast, Witching Stick among them – and limited myself to just a couple of wines from other producers I’ve tasted with recently. Naturally, there were still some winery tables I’d wanted to visit but didn’t have time for, and a few of the tables I stopped at toward the end of the tasting had run out of all but one or two wines. And as usual, some producers poured out of their wines entirely and left early. I tried to sample wines both from familiar producers as well as from ones that were new to me and others whose wines I had not tried in some time. With the smaller number of wineries, there were some past favorites that did not pour this year, so it made it easier for me to check out more producers that I had not tried before. I tried to get to producers from a fairly broad geographical range (though I didn’t make it to the New Zealand table). Of my favorite wines, the largest percentages came from the Sonoma Coast and Russian River Valley, with smaller numbers nearly evenly split among other growing areas including Santa Barbara, Mendocino, Carneros, Santa Cruz Mountains, Oregon, Monterey, and Marin. With just one or two exceptions, the wines I tasted were all current releases or are scheduled to be released later this year. As I’ve come to expect, there were a few wines poured this year that had been poured last year as well. Most of the Pinots I tasted came from the 2011 vintage, followed closely by 2010. Pinots from 2009 made up a smaller percentage, with fewer still from 2008 and earlier – plus one new Pinot release from the 2012 vintage. I found that most of my favorites came from the 2011 vintage – a bit of a surprise to me in that I felt that 2011 wines at other tastings earlier this year were not yet showing their best. It’s tough to make generalizations based on a relatively small number of wines, but perhaps the 2011 Pinots are now starting to come into their own. And despite the 2011 vintage in California being panned by some wine critics, I’ve tasted quite a few Pinots (and other wines) from that vintage that should be outstanding, particularly if given some time to develop in the bottle. As I’ve done in previous lists of favorite wines from Pinot Days, I limited the wines to no more than one per producer. But as is often the case, several producers presented particularly strong line-ups of wine and could have had more wines listed – I thought that Auteur, Failla, Inman, La Follette, and Ladd poured some of the best groups of wines I tasted. Of course there were also a number of Pinots that just missed my list of favorites but were very good. I did not include Pinot Rosés in the list, but Cartograph, Fleur (Mahoney), and Reuling poured especially good ones. There were also a couple of very good non-Pinot wines that I tasted, but since this was Pinot Days, I didn’t think they really qualified to be included in the list. Although I thought there were not many wines this year that were stunningly good, overall there were quite a few standout wines at the tasting, probably a larger percentage than I found last year. Pinot Days continues to celebrate the diversity of Pinot Noir – “one grape, so many styles.” An event such as that can be a challenge these days, with more wine tastings presenting smaller and more narrowly-focused groups of wines. I think there is still a place for larger, more inclusive tastings such as the Pinot Days Grand Festival Tasting, and I hope that more producers will return to pour there in the coming years. 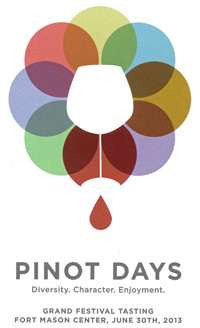 Few other events look to showcase the diversity of Pinots the way that Pinot Days does. It always presents a great opportunity for the public to try out a broad variety of wines from different regions, different vintages, and different styles, as well as to meet many of the winemakers. Pinot Days remains as good a tasting as any to get a sense of where Pinot Noir is at now, and where it may be headed. Alma Rosa 2011 Pinot Noir, Sta. Rita Hills.Medium-light color,with floral aromas along with raspberry and plum fruit, spice, and a touch of oak. Good structure with fine tannins on the long finish. Alma Rosa 2011 Pinot Noir, La Encantada Vineyard,Sta. Rita Hills. Medium-light color, this showed more savory and floral character along with a darker fruit profile, dried herbs, baking spice, and undertones of sweet oak. Medium-bodied and more structured than the previous wine, with juicy acidity and moderate tannins, nice. Comments: Richard and Thekla Sanford established Alma Rosa in 2005, and I think their wines have been consistently good, especially at capturing beautiful aromatics. 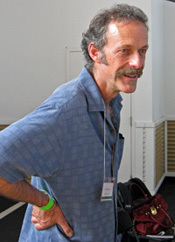 Richard, one of the pioneers of Pinot Noir in Santa Barbara County – and especially in the Sta. Rita Hills – was on hand to pour his wines. Alta Maria 2011 Sauvignon Blanc, Santa Ynez Valley. Made entirely in stainless steel with no malolactic fermentation. Very light straw color, this showed herb and grapefruit aromas. Round mouthfeel with a slight touch of sweetness on the finish. Comments: Alta Maria is a partnership between grower James Ontiveros and winemaker Paul Wilkins. James was behind the table for Pinot Days, but unfortunately I got there just as the event ended and I missed out on tasting the Alta Maria and Native9 Pinot Noirs. I had tasted the 2009 and 2010 Native9 Pinots at an event earlier in the year and both were quite good. Amalie Robert 2010 Chardonnay, “iChardonnay,” Estate, Willamette Valley. Fermented in neutral oak. Light color, displaying earth and tropical fruit on the nose, along with spice and lees notes. Moderately rich and creamy, with a round mouthfeel and finish. Amalie Robert 2009 Pinot Noir, “iPinot,” Estate, Willamette Valley. Light garnet color, with cherry, earth, and spice aromas plus a touch of sweet oak. Medium-bodied with fine tannins on the finish. Amalie Robert 2008 Pinot Noir, “Vintage Debut,” Estate, Willamette Valley. Light ruby color, this showed raspberry and plum fruit, spice, tea leaf, and undertones of vanilla/oak. Medium weight on the palate with good structure and moderate tannins, nice. Comments: Partners Dena Drews and Ernie Pink began converting a cherry orchard into their estate vineyard in 1999. They built a three-level gravity-flow winery and launched the Amalie Robert label a few years later. The “iChardonnay” and “iPinot” bottlings are barrel selections aimed toward internet sales. Amelle 2010 Pinot Noir, Sonoma Coast. Medium-light color, this featured bright and ripe red fruit, herbs, lots of spice, and a touch of oak on the nose. Medium-bodied with a fairly round mouthfeel and fine tannins on the finish. Amelle 2010 Pinot Noir, La Cruz Vineyard, Sonoma Coast. From Swan and La Tâche clones. Medium-light ruby color, this had more intense aromatics with floral and cherry/raspberry notes plus forest floor and spice. Medium weight on the palate with moderate tannins. Amelle 2011 Pinot Noir, Pratt Vineyard, Sonoma Coast. From 23 and 777 clones. Medium-light color, with ripe raspberry, earth, tea leaf, and stony mineral aromas. A bit richer in the mouth with good structure and medium tannins on the finish, nice. Comments: Friends Eric Buffington and Ryan Padgett founded Amelle in 2007 with a Zinfandel from Buck Hill Vineyard. They’ve expanded into Pinot Noir from a variety of sources. The winery name comes from the names of Eric’s and Ryan’s wives, Amanda and Michelle. 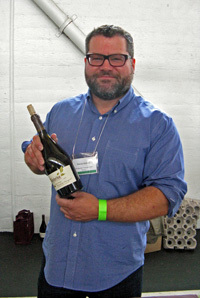 Eric poured his wines at Pinot Days, and both the La Cruz and Pratt bottlings were quite good. August West 2011 Pinot Noir, Rosella’s Vineyard, Santa Lucia Highlands. From Pisoni, 113, and 667 clones, with some whole-cluster fermentation. Medium-light color, featuring red cherry fruit and lots of spice, along with undertones of tea leaf and sweet oak. Lively acidity on the palate, with moderate tannins on the finish. August West 2011 Pinot Noir, Sierra Mar Vineyard, Santa Lucia Highlands. From 23 and Swan clones, about ⅔ whole-cluster fermentation. Medium-light color, this was showed more savory and spicy aromas, plus raspberry and plum fruit. Bigger and more structured than the Rosella’s bottling, with a firmer tannic finish. August West 2011 Pinot Noir, Graham Family Vineyard, Russian River Valley. From 23, 667, 777, and 828 clones. Medium-light color, with intense cherry and spice on the nose, plus earth, herbs, and vanilla/oak notes. Good depth and structure, with lively acidity and fine tannins, nice. Auteur 2010 Pinot Noir, Sonoma Coast. Medium-light color, featuring bright and ripe red fruit, spice, earth, and vanilla/oak. Medium-bodied with a fairly smooth finish. Auteur 2010 Pinot Noir, Shea Vineyard, Willamette Valley. Lighter color, this had a more savory, herbal character along with black cherry and mushroom notes. More structured than the previous wine, with brighter acidity and a moderately tannic finish, nice. Auteur 2011 Pinot Noir, Savoy Vineyard, Anderson Valley. From about 75% Pommard and 25% Wädenswil clones. Medium-light color, with a darker fruit profile plus forest floor, spice, and sweet oak on the nose. Lively mouthfeel with firm tannins on the finish. Auteur 2011 Pinot Noir, Manchester Ridge Vineyard, Mendocino Ridge. From 115 and 777 clones, about 15% whole-cluster fermentation. Medium-light color, this displayed black cherry and raspberry fruit, earth, tea leaf, black pepper, and undertones of sweet oak. Bigger and more structured, with lively acidity and chewy tannins that will need some time to soften – quite distinctive now and should age well. Comments: Kenneth and Laura Juhasz are proprietors of Auteur, which focuses on Chardonnay and Pinot Noir from Mendocino, the Sonoma Coast, and Oregon. Founded in 2004, Auteur has produced many critically-acclaimed wines, and Kenneth makes wines for several other labels as well. Auteur presented one of the best wine line-ups I tasted at Pinot Days. Bailiwick 2010 Pinot Noir, “Foray,” Russian River Valley. Sourced from RLR Vineyard just outside Forestville, this includes 113, 114, and 115 clones, picked and fermented together. Medium-light ruby color, with herbs, plum and darker fruit, earth, and vanilla/oak on the nose. Medium weight on the palate with somewhat chalky tannins on the finish. Bailiwick 2010 Pinot Noir, Michaud Vineyard, Chalone. From 115, 667, 777, and Swan clones. Lighter color, showing black cherry and raspberry fruit, tea leaf, earth, and spice aromas. More structured that the “Foray” bottling, this had lively acidity and firm but refined tannins, nice. Bailiwick 2010 Pinot Noir, Silver Pines Vineyard, Sonoma Mountain. From a vineyard at 900-foot elevation with volcanic soil, 115 clone. Medium-light color, this featured ripe black cherry, forest floor, plenty of spice, and a touch of smoky oak. Richer mouthfeel with more grippy tannins on the finish. Comments: Brothers Bryan and Paul Vais poured their wines – the 2009 vintage was the first for Bailiwick. I had tasted a number of their other Pinots recently so I limited myself to these three. The “Foray” bottling highlights a selected vineyard that will change from year to year. The Bailiwick Michaud Vineyard Pinot was particularly distinctive. Baxter 2009 Pinot Noir, Anderson Valley. Aged in older oak. Medium-light color, with ripe strawberry and cherry, earth, and tea leaf aromas. Lighter-bodied with good acidity and moderate tannins. Baxter 2007 Pinot Noir, Weir Vineyard, Yorkville Highlands. Aged in about 10% new oak. Slightly darker color, ripe plum and raspberry fruit, spice, and earth on the nose. Bolder mouthfeel with a firm tannic finish. Comments: I had tasted a number of Baxter Pinot Noirs recently so I limited myself to these two. Winemaker Phillip Baxter was on hand at the event. The Baxter label was launched in 2002, and focuses on Pinots from Anderson Valley and nearby areas of Mendocino County. Wines undergo native yeast fermentations, and nearly all neutral oak is used for barrel-aging. I’ve been impressed by the Baxter Pinots I’ve tasted. Belle Glos 2011 Pinot Noir, Dairyman Vineyard, Russian River Valley. Medium ruby color, with ripe cherry, spice, cola, and vanilla/oak. Smooth mouthfeel and finish. Belle Glos 2012 Pinot Noir, Clark & Telephone Vineyard, Santa Maria Valley. Released shortly before the tasting. Medium color, this had a darker fruit profile with baking spice, and a woody oak component. Bigger structure than the previous wine, with firm tannins – this will need time to develop. Comments: Belle Glos is a project of the Wagner family, of Caymus fame. Joseph Wagner, grandson of Caymus founders Charlie and Lorna Wagner, heads up the winemaking for Belle Glos. Pinots are made from various vineyard locations, including the Sonoma Coast and Santa Lucia Highlands, in addition to the two I tasted. Benovia 2011 Pinot Noir, Russian River Valley. Sourced from a variety of vineyards and Pinot clones. Medium-light color, ripe cherry fruit, spice, and a mushroom/earth note on the nose. Medium-bodied with a fairly round texture and milder tannins. Benovia 2011 Pinot Noir, Cohn Vineyard, Russian River Valley. Medium-light color, this showed riper raspberry plus cola and vanilla/oak aromas. Bigger on the palate than the previous wine, with a richer texture and finish. Benovia 2011 Pinot Noir, “Bella Una,” Russian River Valley. Medium-light color, displaying bright black cherry and plum, a savory component, lots of baking spice, and a background of sweet oak. Round mouthfeel but good structure, with fine tannins and a lingering finish, nice. Benovia 2011 Pinot Noir, "La Pommeraie," Russian River Valley. 777 & 828 clones from a single vineyard on Laguna Ridge. Medium color, with ripe black cherry, spice, and vanilla/oak aromas. Richer texture combined with lively acidity and moderate tannins and a tasty finish. 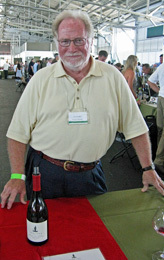 Comments: Joe Anderson and his wife Mary Dewane teamed up with winemaker Mike Sullivan to establish Benovia in 2005. Joe and Mary had purchased Cohn Vineyard a couple of years earlier, and Benovia has two additional estate vineyards – Martaella, adjacent to the winery in Russian River Valley, and a newer vineyard near Freestone in the Sonoma Coast region. The winery’s focus is Chardonnay and Pinot Noir, plus small amounts of Zinfandel and Grenache. Calstar 2010 Pinot Noir, Sangiacomo Vineyard, Sonoma Coast. Medium-light color, this featured earthy raspberry and plum aromas along with mushrooms, black pepper, and a touch of sweet oak. Medium-bodied with a fairly lively mouthfeel and milder tannins. Calstar 2009 Pinot Noir, Londer Vineyard, Anderson Valley. Medium-light color, displaying a darker fruit profile, plus earth, dried herbs, and spice on the nose. Medium-bodied with good structure and refined tannins on the long finish, nice. Comments: Proprietor Rick Davis has made wine for a number of well-known producers – Calstar is his own label, launched in 2001. In addition to Pinot Noir, Calstar makes Chardonnay, Sauvignon Blanc, and Zinfandel. Rick was on hand to pour his wines at Pinot Days. Cargasacchi 2010 Pinot Noir, Cargasacchi Vineyard, Sta. Rita Hills. 100% Clone 115. Medium-light color, this displayed earthy dark fruit, dried herbs, spice, and vanilla/oak aromas. Medium-bodied and with good acidity, finishing with moderately grippy tannins. Cargasacchi 2010 Pinot Noir, Cargasacchi-Jalama Vineyard, Santa Barbara County. From a 375ml bottle. Medium ruby color, with red cherry, tea leaf, and spice, along with a stony mineral note. Bigger and more structured than the previous wine, with bright acidity and tannins that will need time to soften – this will need time but shows lots of promise, nice. Comments: Grower/winemaker Peter Cargasacchi was behind the table pouring his wines. The two Pinots were very distinct from each other, highlighting the character of the vineyards, which are only a few miles apart. Cargasacchi Vineyard was planted in 1998 with Cargasacchi-Jalama Vineyard following the next year. Cartograph 2009 Rosé of Pinot Noir, Russian River Valley. Made by saignée method. Light pink/salmon color, this featured bright red fruits, spice, and touch of citrus on the nose. Medium-light bodied with juicy acidity and a crisp finish, nice. Comments: Alan Baker and Serena Lourie founded Cartograph in 2009 though the label’s roots go back to San Francisco’s Crushpad a few years earlier. Alan – known to some as the “Cellar Rat” from his blog and podcast of the same name – makes the wines. Pinot Noir is Cartograph’s primary focus, but they produce a fine Gewürztraminer as well. By the time I stopped at their table, the Rosé was the only wine they had left to pour, but it was one of the best I tasted at Pinot Days. Clouds Rest 2009 Pinot Noir, “Femme Fatale,” Sonoma Coast. Medium-light color, with cherry, spice, and vanilla/oak aromas along with some earthy notes. Medium-light weight with a round mouthfeel and fairly smooth finish. Clouds Rest 2006 Pinot Noir, Estate, Sonoma Coast. From Pommard and Dijon clones. Medium-light color, displaying bright strawberry and red cherry fruit, earth, forest floor, and spice on the nose. Light and lively texture with refined tannins and a lingering finish, nice. Clouds Rest 2007 Pinot Noir, Estate, Sonoma Coast. Slightly darker color, this had aromas of riper red fruits, plus earth, spice, and smoke. Smoother mouthfeel but finishing with more grippy tannins. Comments: The Clouds Rest estate vineyard was established in 1999. The high-density planting in volcanic soil is located at a 1,250-foot elevation on Sonoma Mountain. Pinot Noir from the estate vineyard is the Clouds Rest flagship wine. Veteran vintner Tony Austin makes the wines. Cornerstone Oregon 2011 Chardonnay, Willamette Valley. Very light color, this displayed green apple and citrus fruit, lees, and spicy oak aromas. Medium weight on the palate, with a moderately rich but lively texture and long finish. Comments: Cornerstone, long-known for fine Napa Valley Cabernets, began a collaboration with Tony Rynders, former longtime winemaker at Domaine Serene, to produce Chardonnay and Pinot Noir from Oregon’s Willamette Valley starting in 2008. I missed out on tasting the Pinot, which was already gone by the time I made it to the table. Derby 2010 Pinot Noir, Derbyshire Vineyard, San Simeon, San Luis Obispo County. From 115, 667, and 777 clones, 10% whole-cluster fermentation, aged in 18% new French oak. Medium-light color, showing ripe strawberry and red cherry, fresh herbs, spice, and vanilla/oak on the nose. Medium-bodied with lively acidity and fairly mild tannins on the finish. Derby 2010 Pinot Gris, Derbyshire Vineyard, San Simeon, San Luis Obispo County. Made in stainless steel. Light straw color, with stone fruit and citrus aromas plus an herbal scent. Juicy acidity and a crisp, clean finish, nice. Comments: Derby’s Steve and Tiffinee Vierra were on hand to pour the Derby wines. Steve manages the vineyards while Tiffinee is the winemaker. Derbyshire vineyard is just a mile from the Pacific Ocean near San Simeon, and the wines always show bright acidity. Dutton-Goldfield 2011 Pinot Noir, Fox Den Vineyard, Green Valley of Russian River Valley. From 115, 667, and 777 clones, aged in 50% new oak. Medium-light color, this showed bright cherry and raspberry fruit, plus spice, earth, and sweet oak. Medium-bodied with a lively mouthfeel with milder tannins. Dutton-Goldfield 2011 Pinot Noir, Angel Camp Vineyard, Anderson Valley. From Pommard, 667, and 828 clones, aged in 50% new oak. Medium-light ruby color, featuring floral aromas along with earth, tea leaf, and raspberry, with undertones of vanilla/oak. More structured than the previous wine, with vibrant acidity and fine tannins on the finish, nice. Comments: The winery is a partnership of noted Russian River Valley grower Steve Dutton and well-known winemaker Dan Goldfield (formerly at La Crema and Hartford Court). The first Dutton-Goldfield releases were a Chardonnay and Pinot from the 1998 vintage, and those varieties remain the core of their production. They’re one of the few wineries making Pinot from Marin County, now producing two bottlings from different vineyards there. Failla 2011 Pinot Noir, Keefer Ranch, Russian River Valley. Destemmed, and aged in 33% new oak. Medium-light ruby color, with black cherry plus some cola and spice notes. Medium-light bodied, with a lively mouthfeel and milder tannins on the finish. Failla 2011 Pinot Noir, Occidental Ridge Vineyard, Sonoma Coast. About 25% whole-cluster fermentation. Medium-light color, this displayed more savory herb aromas along with red fruits, earth, and baking spices. Medium weight on the palate with bright acidity and more structure than the Keefer Ranch bottling, this had a long finish with refined tannins, nice. Comments: Originally called Failla Jordan, the winery was founded in 1998 by winemaker Ehren Jordan and his wife Anne-Marie Failla. Their first Pinot was a Keefer Ranch bottling from the 1999 vintage, and Pinot has been the core of the Failla production over the years. Savanna Wright poured the Failla Pinots, and both wines were very good. Freeman 2011 Pinot Noir, Russian River Valley. Sourced from seven vineyards. Medium-light color, with plum and darker berry fruit fruit, earth, spice, and sweet oak aromas. Medium weight on the palate with a fairly round texture and milder tannins on the finish. Freeman 2011 Pinot Noir, Keefer Ranch Vineyard, Russian River Valley. From 2A, 23, 115, and 777 clones. Medium-light ruby color, this displayed black cherry, dried herbs, baking spice, and a touch of vanilla/oak. More structured than the previous wine, with fine tannins and a long finish. Freeman 2011 Pinot Noir, “Akiko’s Cuvée,” Sonoma Coast. A barrel selection, sourced from nine vineyards in 2011. Slightly lighter color, featuring more herbal and forest floor notes, along with strawberry, earth, and spice. Brighter mouthfeel with good structure and a long, lively finish with moderate tannins, nice. Comments: Established in 2001 by Ken and Akiko Freeman, the winery features a striking wine cave tunneled into the hills west of Sebastopol. Making exclusively Chardonnay and Pinot Noir, Akiko heads up the winemaking team, which includes consulting winemaker Ed Kurtzman. Freeman farms a 7-acre estate vineyard near the winery and a newer 14-acre Sonoma Coast vineyard located just three miles from the ocean. 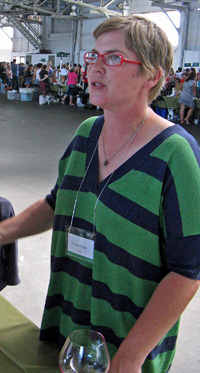 Akiko was behind the table at Pinot Days and poured a strong group of wines. Furthermore 2012 Rosé of Pinot Noir, California. Made by saignée method. Light pink/salmon color, with ripe strawberry and herb aromas. A richer style, with a fairly smooth texture and pleasant finish. Furthermore 2010 Pinot Noir, Weir Vineyard, Yorkville Highlands. Lighter ruby color, this was earthy and herbal, with plum and raspberry fruit and touches of spice and sweet oak. Medium-bodied with fairly mild tannins. Furthermore 2010 Pinot Noir, Sierra Mar Vineyard, Santa Lucia Highlands. Medium-light color, featuring ripe black cherry fruit plus baking spices and undertones of earth and vanilla/oak. Richer mouthfeel with a fairly smooth finish. Furthermore 2010 Pinot Noir, La Encantada Vineyard, Sta. Rita Hills. Medium-light color, this displayed ripe darker fruit, spice, a hint of black pepper, and vanilla/oak aromas. More structured on the palate, finishing with moderately grippy tannins. Comments: Launched in 2006 by Bob Zeches and Chad Richard at San Francisco’s Crushpad, Furthermore continues to produce their wines in the city. The winery makes exclusively Pinot Noir, sourced from a number of vineyards in Sonoma, Mendocino, Monterey, and Santa Barbara Counties. Hilliard Bruce 2011 Pinot Noir, “Sun,” Sta. Rita Hills. Sourced from all Pinot blocks of the estate vineyard. Medium-light color, this displayed ripe raspberry and spice aromas, along with dried herbs, spice, and sweet oak. Medium-bodied with bright acidity and a lingering finish, nice. Comments: Fruit for the Hilliard Bruce wines is sourced entirely from their 21-acre estate vineyard – 18½ acres of Pinot and 2½ acres of Chardonnay, planted 2004-2007. Owner John Hilliard has taken over the winemaking from former consulting winemaker Paul Lato in the past couple of vintages. I had tasted several other Hilliard Bruce Pinots recently so I limited myself to this new release, which was quite good. HKG 2011 Pinot Noir, “North Bridge,” Estate, Russian River Valley. From a lower part of the vineyard with sandy soil, with Pommard, 115, and 777 clones. Medium color, with ripe cherry, spice, and vanilla/oak. Medium-bodied with good structure and moderate tannins. HKG 2011 Pinot Noir, “Twin Corners,” Estate, Russian River Valley. From a higher part of the vineyard with loamy soil, with mostly Pommard clone plus 667 and 777. Medium-light color, this featured red fruits, cola, spice, and a dash of oak. A bit lighter-bodied than the previous wine with a rounder mouthfeel and finish. HKG 2010 Pinot Noir, Estate, Russian River Valley. Includes Pommard, Jackson 29, Colmar 538, 114, 777, and 828 clones. Medium ruby color, displaying floral black cherry and plum aromas, along with spice and sweet oak. Medium-bodied with more structure and tannin than the other two wines. Comments: Begun in 2004, HKG is a more limited-production and upscale label from Hop Kiln. HKG stands for Hop Kiln Grown, with all fruit from their estate vineyard in the heart of Russian River Valley. The vineyard was replanted starting in 2006 with Pinot Noir, Chardonnay, and Pinot Gris. Chuck Mansfield, son of noted El Dorado County grower Ron Mansfield, is the HKG winemaker. Inman 2009 Pinot Noir, Russian River Valley. Sourced from Olivet Grange and Thorn Ridge vineyards. Light color, with bright cherry and strawberry fruits, herbs, and a stony/mineral note. Medium-light bodied and lively with very good structure and moderate tannins. Inman 2009 Pinot Noir, “OGV,” Russian River Valley. From 114, 115, 667, 777 and 828 clones at the Inman Family’s Olivet Grange estate vineyard, with about 20% whole-cluster fermentation. Light ruby color, featuring very bright red fruit aromas plus earth, baking spice, and herb notes. Vibrant mouthfeel with fine tannins on the long finish, nice. Inman 2010 Pinot Noir, Russian River Valley.Light color, this was less fruit-forward than the 2009 Pinots, showing more earth, spice and fresh herb scents plus cranberry and strawberry fruit. Lighter-bodied with good structure, finishing with moderate tannins. Very appealing now and should develop nicely with more bottle age. Inman 2012 Pinot Gris, Russian River Valley. Bottled just a few weeks previously. Very light straw color, with apple, citrus, and herb notes. Juicy acidity in the mouth, with a clean, crisp finish, nice. Inman 2011 Chardonnay, Russian River Valley. Light color, featuring stone fruit, lees, spice, and a touch of vanilla/oak. Medium-bodied with a bright mouthfeel and moderately rich finish. Comments: Simon and Kathleen Inman founded their winery in 2000, and they planted Pinot Noir and Pinot Gris at their estate Olivet Grange Vineyard the same year. 2002 marked the first vintage of Inman wines. Kathleen makes the wines, which have always displayed a lighter style than many from Russian River Valley. 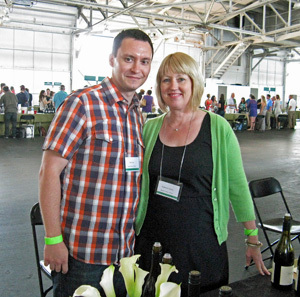 Kathleen and Mike Sai were behind the table for Pinot Days and they presented a very good line-up of wines. Kanzler 2011 Pinot Noir, Sonoma Coast. Made with 20% whole-cluster fermentation, 40% new oak. Medium-light ruby color, with savory and floral aromas, plus raspberry and plum fruit and vanilla/oak. Medium-bodied with a bright, lively texture and fine tannins, nice. Kanzler 2010 Pinot Noir, Sonoma Coast. Made with 20% whole-cluster fermentation, 30% new oak. Medium-light color with riper fruit, spice, and sweet oak. Richer mouthfeel than the 2011, with a bit more tannic grip on the finish. Comments: Steve and Lynda Kanzler’s vineyard is located in the Sebastopol Hills area and was planted in 1996 to 667, 115, and Pommard Pinot clones. They’ve sold fruit to other producers (notably Kosta Browne) and launched their own label in 2004. Their son Alex has taken over the winemaking in recent years, and he poured the wines at Pinot Days. Kendric 2009 Pinot Noir, Marin County. About 65% whole-cluster fermentation. Light ruby color, this featured red fruit, tea leaf, and vanilla/oak on the nose. Lighter-bodied with a lively mouthfeel and medium-light tannins. Kendric 2010 Pinot Noir, Marin County. About 67% whole-cluster fermentation. Slightly darker color than the 2009, with bright strawberry and cherry fruit, floral and mildly stemmy herbal notes, and a background of sweet oak. Medium-light weight on the palate with more structure than the 2009 and a bit more grip on the finish. Nice now and should improve with time in the bottle. Kendric 2006 Pinot Noir, Marin County. Poured from magnum. Light color, this was less fruit-forward with the savory/herbal side coming to the fore along with red fruits, spice, and a slight floral component. Lively and still retaining good structure, with moderately chalky tannins on the finish – this is developing nicely and should continue to do so. Comments: Stewart Johnson’s estate vineyard, on the northern edge of Marin County, was first planted in 2002, mostly to seven clones of Pinot Noir. 2004 was the first Kendric release, and in recent vintages, Stewart has worked with more whole-cluster fermentations and longer macerations. He was behind the table at Pinot Days, and as usual, he brought an older vintage of his Pinot to compare with the latest releases. La Follette 2011 Pinot Noir, Sangiacomo Vineyard, Sonoma Coast. From 114, 777, and Swan clones. Medium-light color, displaying the earthy aromas typical of this vineyard, along with bright cherry and raspberry fruit, spice, and a stony mineral note. Medium-bodied with fine tannins and a lingering finish, nice. La Follette 2010 Pinot Noir, Van der Kamp Vineyard, Sonoma Mountain. Includes 777, 828, 23, Martini, and Swan clones. Medium-light ruby color, this showed riper fruit with savory and spicy components and undertones of vanilla/oak. More structured than the previous wine, with chalky tannins on the finish. Comments: LaFollette is a partnership between owners Pete and Terri Kight and winemaker Greg LaFollette, and focuses on Chardonnay and Pinot sourced from five vineyards in Russian River Valley, Sonoma Coast, Sonoma Mountain and Mendocino Ridge. The winery’s first releases were from the 2009 vintage. 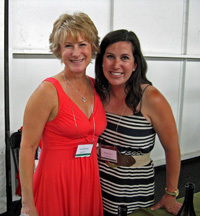 Lisa Gower poured the La Follette wines at the tasting, and both Pinots were distinctive and quite good. La Rochelle 2009 Pinot Noir, Santa Lucia Highlands. Medium-light ruby color, with ripe cherry fruit, lots of spice, and a somewhat resiny oak character. Medium-bodied with a moderately smooth mouthfeel and finish. La Rochelle 2010 Pinot Noir, Soberanes Vineyard, Santa Lucia Highlands. The vineyard is adjacent to Garys’ Vineyard and planted to Pisoni clone Pinot. Medium-light color, this featured earthier aromas along with raspberry fruit and spice. Brighter mouthfeel than the previous wine, with a lively finish. La Rochelle 2010 Pinot Noir, Donum Estate Vineyard, Carneros. Medium-light color, with aromas of cherry, earth, and spice plus notes of tea leaf and sweet oak. Medium weight on the palate with more structure, finishing with moderately chalky tannins, nice. Comments: Steven Kent Mirassou is a 6th-generation vintner, a member of the noted Mirassou wine family of California. Steven purchased the La Rochelle label from the family in 2005. The winery specializes in Chardonnay and Pinot Noir sourced mostly from Sonoma and Monterey Counties, as well as from Anderson Valley and Oregon. 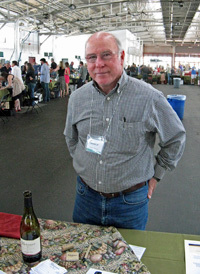 Tom Stutz, who had formerly worked at Hanzell and Mirassou, makes the La Rochelle wines, and he was behind the table at Pinot Days. Ladd 2009 Pinot Noir, Anderson Valley. Lighter color, with bright strawberry and spice aromas along with touches of earth and tea leaf. Medium-light bodied with juicy acidity and structure for aging, finishing with fine tannins, nice. Ladd 2010 Pinot Noir, Nash Mill Vineyard, Anderson Valley. Medium-light ruby color, this showed more upfront fruit than the previous wine, plus earth forest floor notes and hints of spice and oak. Very lively mouthfeel with moderate tannins, this should be good but still needs more time to come together. Ladd 2009 Pinot Noir, Russian River Valley. Medium-light color, with a slightly riper fruit profile than the first two wines, showing black cherry, earth, and spice on the nose. Rounder on the palate, with a long, tangy finish. Ladd 2009 Pinot Noir, “Cuvée Abigail,” Sonoma Coast. Medium-light color, featuring bright cherry and raspberry fruit, lots of spice, and touches of black pepper, earth, herbs, and a touch of sweet oak. Lively and structured in the mouth, with moderate tannins and a lingering finish, nice. MacPhail 2010 Pinot Noir, Sangiacomo Vineyard, Sonoma Coast. From 50% each Pommard and 115 clones, aged in 50% new oak. Medium-light color, this was earthy and somewhat funky on the nose (characteristic of the vineyard) along with black cherry and hints of spice and smoky oak. Medium-bodied with a moderately tannic finish. MacPhail 2010 Pinot Noir, Sonoma Coast. Sourced from Sun Chase, Pratt, and Wildcat vineyards, aged in 40% new oak. Medium color, with raspberry and plum fruit, earth, and a slightly resiny note. Bigger and more structured than the previous wine, with some rough tannins that will take time to smooth out. Comments: Grower/winemaker James MacPhail launched the winery in 2002, and he makes Pinots from both Anderson Valley and the Sonoma Coast. Pinots all undergo native primary and malolactic fermentation. MacPhail’s new energy-efficient production facility is located just outside Healdsburg. Fleur 2012 Pinot Noir Rosé, Carneros. Very light pink color, featuring bright floral and strawberry scents plus a slight note of fresh herbs. Zippy acidity in the mouth, with a crisp, clean finish, nice. Fleur 2011 Pinot Noir, Carneros. Medium-light ruby color, this had earthy and floral aromas upfront along with red fruits and spice. Lighter-bodied and pleasant, with very mild tannins, a good value for a lighter Pinot. Mahoney 2009 Pinot Noir, Carneros. Sourced from the Las Brisas and Mahoney Ranch vineyards. Medium-light color, with riper and higher-toned cherry, spice, and a dash of sweet oak. Medium-bodied with a moderately tannic finish. Mahoney 2010 Pinot Noir, Las Brisas Vineyard, Carneros. Medium-light color, this was less fruit-forward than the previous wine, displaying earth, spice, and tea leaf with more focused cherry and strawberry fruit. Medium weight on the palate with good structure and fairly firm tannins, nice. Comments: Francis Mahoney (of Carneros Creek fame) owns and farms both the Las Brisas and Mahoney Ranch vineyards, located at opposite ends of the Carneros AVA. Ken Foster is the winemaker. Fleur de California is a second label for value-priced wines, while Mahoney includes a number of wines made from Italian and Spanish grape varieties in addition to their flagship Pinots and other wines. Francis was behind the table at Pinot Days. Riverbench 2011 Pinot Noir, “Mesa,” Santa Maria Valley. 100% Martini clone from the vineyard’s Mesa Block, a bit higher elevation than the rest. Medium-light color, with earthy and herbal aromas upfront, followed by strawberry and cherry fruit. Medium weight in the mouth with a smooth texture and milder tannins. Riverbench 2011 Pinot Noir, “One Palm,” Santa Maria Valley. 100% 667 clone. Slightly darker color, this showed riper cherry, plum, and rhubarb notes along with spice and tea leaf. Medium-bodied and more structured than the previous wine, with good acidity and a moderately tannic finish. Comments: The first wines under the Riverbench label were from the 2006 vintage, but Riverbench Vineyard was first planted in 1973, specializing in Chardonnay and Pinot Noir. They continue to sell most of the fruit from their 300+ acre vineyard near the Sisquoc River. 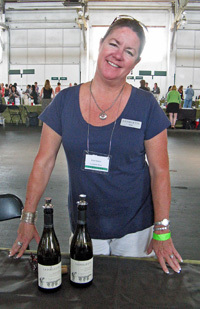 Clarissa Nagy took over as Riverbench winemaker from Chuck Ortman in 2012. Reuling 2012 Rosé of Pinot Noir, Sonoma Coast. From younger vines, pressed after three days on the skins, aged in neutral oak. Very light pink, displaying strawberry, earth, and a floral note on the nose. Medium-light bodied with a lively mouthfeel and finish, nice. Reuling 2011 Pinot Noir, Sonoma Coast. From Calera clone and two “suitcase” Vosne-Romanée clones, about 25% whole-cluster fermentation. Medium-light ruby color, aromas of black cherry, herbs, baking spices, and a touch of vanilla/oak. Medium-bodied with a moderately rich texture and fairly mild tannins. Comments: Reuling Vineyard is located near Forestville and was planted in 2000, and both Aubert and Peter Michael have made acclaimed wines from Reuling fruit over the years. Proprietors Tim and Jackie Reuling launched their own label in 2011, and the wines poured at Pinot Days are some of their initial releases. Matt Taylor is the winemaker. Scherrer 2008 Pinot Noir, Russian River Valley. Medium-light color, this featured fairly ripe cherry fruit plus earth, spice, and sweet oak. Medium weight on the palate with a silky texture, finishing with milder tannins. Scherrer 2009 Pinot Noir, Russian River Valley. Medium-light color, with bright strawberry and cherry fruit plus touches of spice, flowers, and dried herbs. A bit richer mouthfeel than the previous wine, with more acidity and moderate grip on the finish. Scherrer 2008 Pinot Noir, Platt Vineyard, Sonoma Coast. Slightly darker color, displaying a more savory character along with raspberry and black cherry, mushrooms, and plenty of spice. More structured than the RRV bottlings, finishing with refined tannins. Scherrer 2009 Pinot Noir, Platt Vineyard, Sonoma Coast. Medium ruby color, this had stony/minerally notes, herbs and earth, with a darker fruit profile than the previous wine. Medium-bodied with great depth and plenty of structure to age, finishing with grippier tannins that still need time. Quite good now and should develop nicely in the cellar. Comments: Fred Scherrer founded his winery in 1991, while he was still working at Dehlinger (he left there in 1998). He makes Chardonnay, Dry Rosé, Pinot Noir, Zinfandel, Syrah, and Cabernet Sauvignon. The Zins and some of the Cabs come from a vineyard in Alexander Valley that Fred’s grandfather first planted in 1912. The Scherrer Pinots always strike a balance between bigger and lighter styles, and the wines that Fred poured displayed distinctiveness between both the vineyard sources and vintages. Sequana 2010 Pinot Noir, Russian River Valley. Medium color, featuring black cherry, spice, and vanilla/oak aromas. Fairly round mouthfeel and moderate tannins on the finish. Sequana 2010 Pinot Noir, Sundawg Ridge Vineyard, Green Valley of Russian River Valley. From a vineyard planted in 1999. Medium color, this showed a more savory character, plus raspberry, earth, spice, and sweet oak notes. More structured than the previous wine, with fine tannins and a lingering finish, nice. Comments: The Sequana wines are made by noted Pinot producer James MacPhail. Fruit is sourced from the Green Valley of Russian River Valley and the Santa Lucia Highlands and the first wines were produced from the 2007 vintage. Jim Caudill was behind the Sequana table, and I particularly liked the Sundawg Ridge bottling. Small Vines 2011 Pinot Noir, Russian River Valley. From 11 Pinot clones at Baranoff and Small Vines Estate vineyards. Medium-light ruby color, with ripe black cherry, dried herbs, cola, and sweet oak. Medium-bodied with a lively texture and moderate tannins. Small Vines 2011 Pinot Noir, Baranoff Vineyard, Russian River Valley. To be released in the fall, made mostly from Calera clone. Medium color, this was less fruit-forward with more earth and herb aromas plus raspberry and black cherry fruit, spice, and a touch of oak. Bigger and more structured than the previous wine, with firm tannins and a lingering finish, nice. Small Vines 2010 Pinot Noir, MK Vineyard, Sonoma Coast. From 114, 115, 667, 777 clones. Medium-light color, with higher-toned plummy fruit, spice, and a somewhat woody oak character. Medium-full bodied with a grippier tannic finish. Comments: Paul and Kathryn Sloan established their Small Vines Viticulture business in 1998, developing and farming high-density planted vineyards in the Russian River Valley and Sonoma Coast. They released the first Small Vines Wines Pinot from the 2005 vintage, and Byron Kosuge has been the consulting winemaker since 2010. 2011 marked the first harvest of the Small Vines estate vineyard near Sebastopol. Thomas Fogarty 2011 Pinot Noir, Razorback Vineyard, Estate, Santa Cruz Mountains. First vineyard-designate release from this estate vineyard. Medium-light color, displaying bright fresh red fruits, earth, tea leaf, and hints of flowers and vanilla/oak. Medium weight with juicy acidity and a lively finish with moderate tannins, nice. Thomas Fogarty 2011 Pinot Noir, Rapley Trail Vineyard, Estate, Santa Cruz Mountains. From a vineyard planted in 1981. Medium-light color, this showed riper black cherry and raspberry, spice, earth, and more noticeable oak than the previous wine. Richer mouthfeel with good structure and a bit grippier tannic finish. Comments: Thomas Fogarty planted his first Chardonnay and Pinot Noir vines in 1978, and the winery was founded in 1981. Longtime associate winemaker Nathan Kandler took over for original Thomas Fogarty winemaker Michael Martella earlier this year. There are three distinct estate Pinot vineyards – Windy Hill (being replanted), Rapley Trail, and Razorback. The Rapley Trail bottling has been a consistent favorite but the inaugural Razorback single-vineyard release impressed me even more. Winderlea 2011 Pinot Noir, Winderlea Vineyard, Dundee Hills. From Pommard, Coury, 114, 115, 667, and 777 clones, aged in 17% new oak. Medium-light ruby color, with bright cranberry and strawberry fruit, lots of earth and tea leaf, some floral notes, and smoky oak. Medium weight on the palate with a fairly round texture and fine tannins, nice. Winderlea 2011 Pinot Noir, Shea Vineyard, Yamhill-Carlton. From Pommard and Wädenswil clones, aged in 13% new oak. Slightly darker color, showing riper and darker fruit, plus plenty of spice and undertones of vanilla/oak. More structured mouthfeel, with moderate tannins on the finish. Winderlea 2011 Chardonnay, Willamette Valley. Made with Dijon and Wente clones sourced from three vineyards, aged in 85% oak and 15% stainless steel. Light straw color, displaying apple, earth, herb, and spice aromas. Lively acidity with a long finish, nice. Comments: The Winderlea Vineyard was formerly known as Goldschmidt, and includes some of the oldest Pinot vines in Willamette Valley, dating to 1974. Bill Sweat and Donna Morris purchased the property in 2006 and launched their Winderlea label the same year. 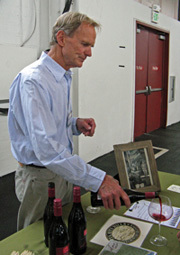 Patrick Harkins poured a strong line-up of Winderlea wines at this year’s Pinot Days. Windy Oaks 2009 Pinot Noir, “Limited Release – 100% Whole Cluster,” Estate, Santa Cruz Mountains. Fairly light ruby color, with higher-toned ripe red fruits, some stem/herb notes, spice, and vanilla/oak aromas. Medium weight and structure, with moderate tannins. Windy Oaks 2010 Pinot Noir, “Limited Release – Wood Tank-Fermented,” Estate, Santa Cruz Mountains. Fermented in one-ton French oak tanks, with some whole clusters. Medium-light color, this was less fruit-forward, featuring lots of exotic spices along with red berry fruit, earth, and a background of vanilla/oak. More structured than the previous wine, with juicy acidity and fine tannins, nice. Comments: Windy Oaks owners Jim and Judy Schultze began planting their estate vineyard in the Corralitos area in 1996, and they now farm about 26 acres, most of it Pinot Noir. The first vintage of Windy Oaks Pinot was from 1999, and Jim and Judy’s son Spencer joined the winemaking team in 2011. Their wines are always among the best from the area, and their Limited Release bottlings are quite distinctive. Woodenhead 2010 Pinot Noir, “Wet Kiss,” Russian River Valley. Sourced from three vineyards, with mostly Martini clone plus a little Swan. Medium-light color, showing bright cherry fruit, spice, tea leaf, and vanilla oak aromas. Juicy acidity in the mouth, with milder tannins. Woodenhead 2009 Pinot Noir, Wiley Vineyard, Anderson Valley. From 27 year-old Pommard and Mt. Eden clone vines. Slightly darker color, this featured higher-toned red fruits, earth, and herbs on the nose. Medium-bodied with more structure than the previous wine, and moderate tannins on the finish. Comments: As usual, Woodehead proprietors Nick Stez and Zina Bower poured their wines at Pinot Days. Nick worked with Burt Williams at Williams Selyem for 17 years before starting his own label in the late 1990s. Woodenhead specializes in Pinot Noir and Zinfandel from a variety of vineyard sources. Z’IVO 2007 Pinot Noir, Eola-Amity Hills, Willamette Valley. Medium-light color, with earthy raspberry and lots of spice, along with undertones of sweet oak. Medium-bodied with a moderately tannic finish. Z’IVO 2009 Pinot Noir, Eola-Amity Hills, Willamette Valley. Medium-light color, displaying more intense black cherry, earth, tea leaf, and spice aromas. Medium weight with good structure, fine tannins, and a long finish, nice. Comments: Z’IVO is the project of winemaker John Zelko and his wife Kathy, and their first commercial release was from the 2000 vintage. Their estate vineyard is planted to Pommard, 114, 115, 667, and 777 Pinot clones. A small amount of whole-cluster fermentation is typically used and the wines are aged in about 33% new oak.